On Monday I decided I wanted to cook up the moose muscle I had sitting in my freezer ( I suppose technically I decided on Sunday ). I borrowed the slow cooker from my neighbour since this is in no way a tender meat. I had invited her son over to join me since there would be extra and it is the polite thing to do. I was not able to find anyone to check on the food late morning (I left the dogs at home and do not trust Galaxy). I had to turn it on high after I got back from my mothers doctor appointment. Well, after 3.5 hours on high in the slow cooker, .5 hour boiling, and another 1 hour of boing (after I cut off the tissue). This is what I got! 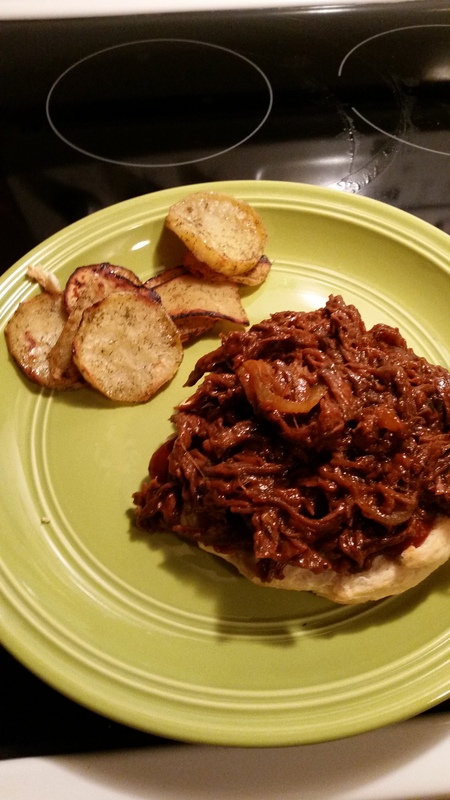 Pulled BBQ moose meat on top of bannock and yam chips. It was amazing, although my bannock is still a little off. The yams have extra virgin olive oil, brown sugar, dill, and nutmeg on them. I am very much tempted to do this with my moose stew meat (when the dogs are not home so it is nicely tender). When I do eat meat I make sure that it is worth it. Plus, game meat is my weakness.